What’s up with that? You’ve got to be kidding! Not me, not this time! I thought I’d never do that again! You can’t be talking to me! Wasn’t that something you gave me to do a long time ago? Lord, I have no desire to teach kids again. Don’t you remember I’m retired now! I know they need help in that area, but why me? I’m sure other people can do it. They just need to step up! I’ve had my turn at a classroom of chatty, fidgety kids! See, I still have two purple hearts to prove it. All right, I guess that’s a little melodramatic, but I had to get my frustrations off my chest. Sound familiar? I wish I could say I had that conversation with God five years ago, but in actuality that was me a little over three months ago. First, I had a dream in which I saw myself standing in front of a classroom. I often share my dreams with my husband, but I decided to tuck that one away, deciding to ignore any early signs that God might be talking to me about something I really didn’t want to do. Then in April I attended a “Pearls of Wisdom” gathering at my church. This was a program given by our senior ladies (Yeah, I know I technically fit in that category, but I’ve not made my public declaration–except at Kroger to get my discounts on Senior Day). The topic of the day was “The Fruit of the Spirit.” You know: Love, joy, peace, etc. I was particularly “moved” by the speech on long-suffering. How heart-felt, I thought. We can all relate to that one! It’s the fruit nobody likes to talk about–the one that teaches us to endure in the face of adversity. Whew, I remember many times in my life when I prayed and pressed my way through some pretty tough seasons! At the end of the presentations, someone stood to my right and made a passionate plea to the audience. “Ladies, we are desperately in need of teachers for our children! If you can help, see me after the meeting is over.” Bells and whistles went off in my head and my heart started pounding loudly. The thing I feared had come upon me (suddenly). Ernest Hemingway, in one of his novels, declared, “For whom the bell toll? It tolls for thee!” Yep. That’s right! Before long, I found my legs carrying me over to the announcer and giving her my name, rank and serial number. What did I just do? Was that really me? My lesson in long-suffering began to take on new meaning as I pondered the consequences of my actions. Lesson plans, grading papers, disciplining students, meeting with parents–I began rehearsing the whole scenario. 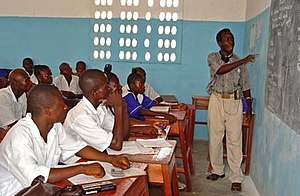 Then I went on a missions trip to Jamaica and visited several public schools. I saw the faces of hundreds of students who needed to know that somebody cared about them. I noticed one young girl standing in the background, crying profusely on her friend’s shoulder. “What’s the matter?” I asked. “Her mommy died last week,” her friend informed me, patting the weeping girl gently on her back. I took her in my arms and prayed for her. I also remember asking several students what they wanted to do in life. All students had high aspirations, from banker to lawyer to engineer to teacher, among others. I was deeply moved, learning later that students in Jamaica have no public transportation. Their parents pay for taxis to get their children to school. How proud they looked in their school uniforms! Jerusalem–local; Judea–national; Samaria–across many cultures; the ends of the earth–as far as land and sea extend. If I could go to the schools in Jamaica, I could not ignore the call to my local Sunday school. I don’t share these thoughts to impress anybody. You see, our God is no respecter of persons. What is He calling you to do? What have you laid down? What is He asking you to pick up again? Let go of your expectations and trust Him. What has He equipped you to do? Is He asking you to try it again? OMG Patricia! This is your best entry yet. And you know I’m a true fan of you and your writing. Its never over until HE says its over. He may call us to do the same thing again and again, even when we think its all said and done. But the gifts never die. They never run out. And while we can “choose” to let them lie, the stirring of the Holy Spirit with make them arise within us again. When He whispers, “I have need of you” in whatever manner that comes, we must rise up again! Jamaica was a set-up, Tricia. He had you at “hello”! Congratulations! And welcome back to the world of the working! Thanks, Michele. Appreciate your encouragement. I’ll keep you posted as I follow our Great Shepherd. Much is happening right now. Keep me in your prayers. Glad to know you’re inspired! Thanks, Denise. Your friendship and support are ever appreciated!